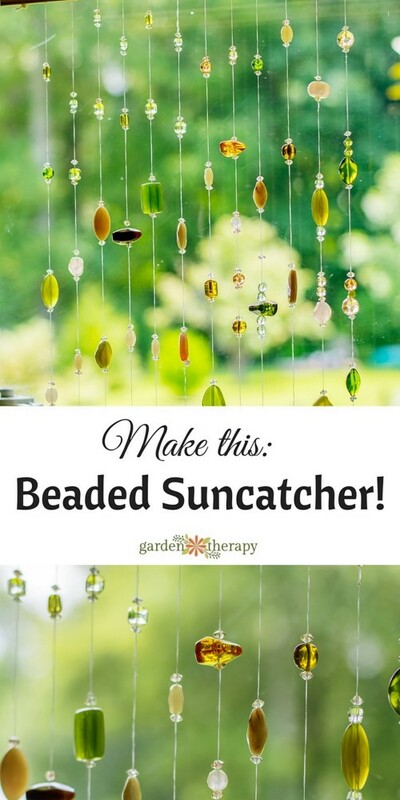 Whether you want to catch the golden rays of the sun or just want to add a little dazzle to your window, a beaded suncatcher is a fun and easy project you can complete in an afternoon. I have a window in the back of my living room that was a persistent danger to my feathered friends. Birds would fly into that window on a daily basis. Why do birds fly into windows? It’s because they see the reflection of sky or trees in the pane of glass instead of a window. The best way to help the birds from doing this is to disrupt the reflection. 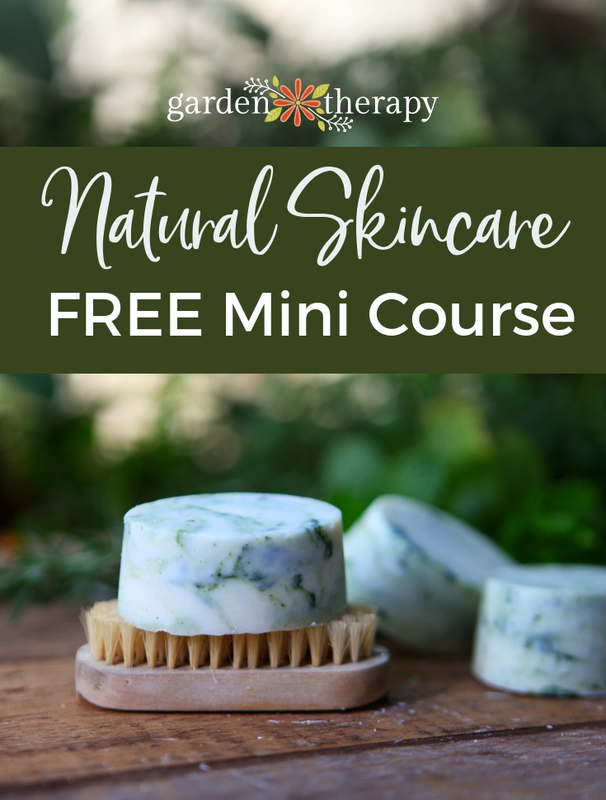 There are several ways to do this: you can use stickers, cover the window or draw streaks across the surface with soap. 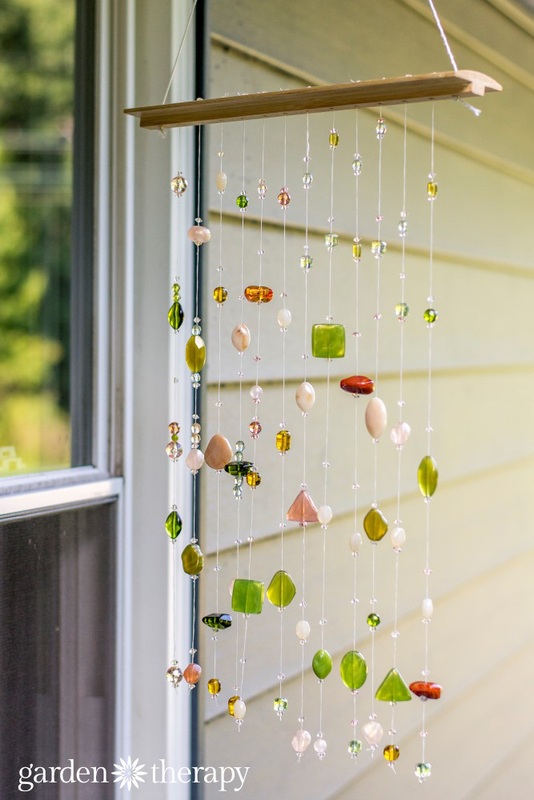 I wanted a prettier solution: a suncatcher! Please note that links go to affiliates. 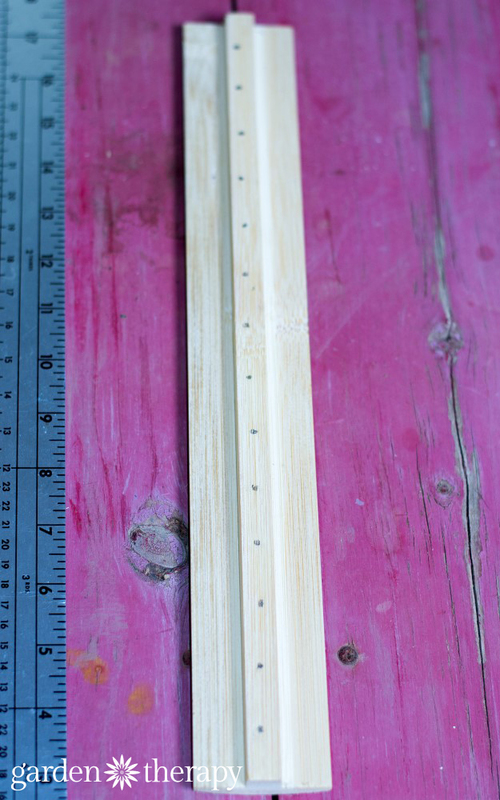 Get your piece of wood and measure 1 inch increments along its length. I used a piece of bamboo flooring leftover from another DIY project. 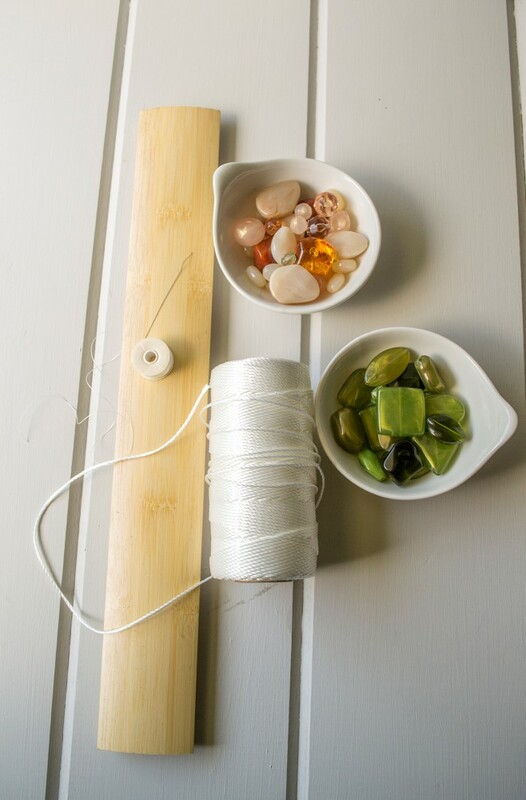 You can use a dowel rod or even driftwood for this project. I drilled 12 holes along the length of the bamboo. 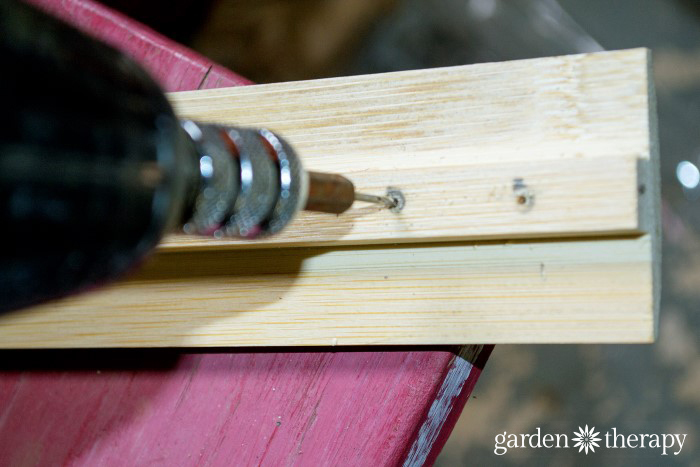 Use a small drill bit to drill a hole in each of your marked increments. The two holes at each end of the wood will be where the nylon string will be inserted to created a hanger, so these might have to be a little bit larger in order to fit the thicker nylon rope. I drilled 12 holes in all. This means I need 10 strings of beads for my mobile. Cut a length of rope at least 24 inches long. 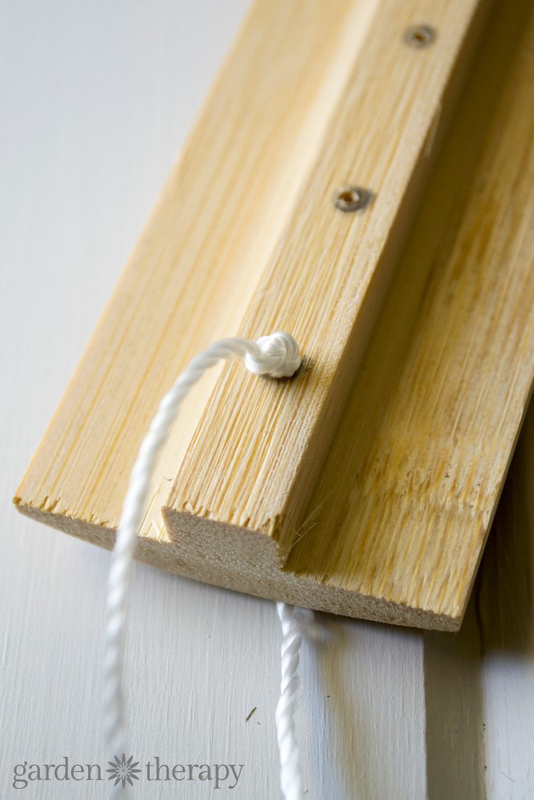 String the nylon rope through one of the drilled holes on the end. 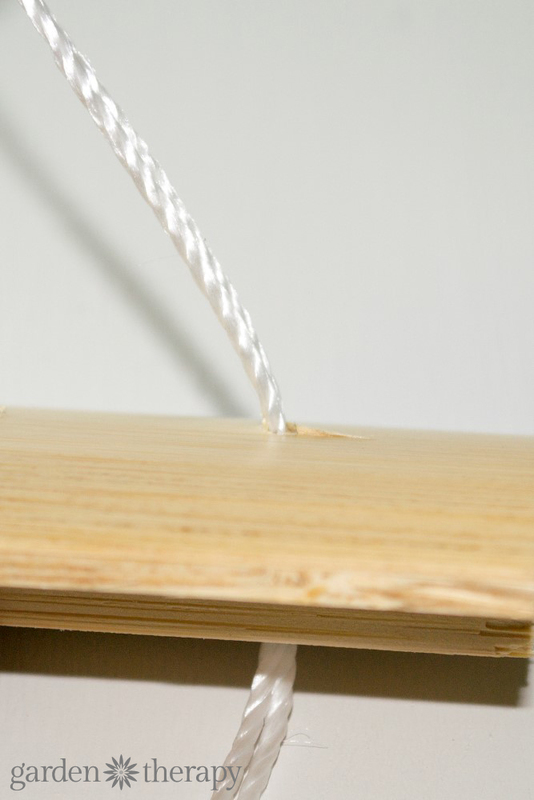 Pull it through and string in through the drilled hole on the opposite end of the piece of wood. Secure the nylon rope with a double knot on each end. 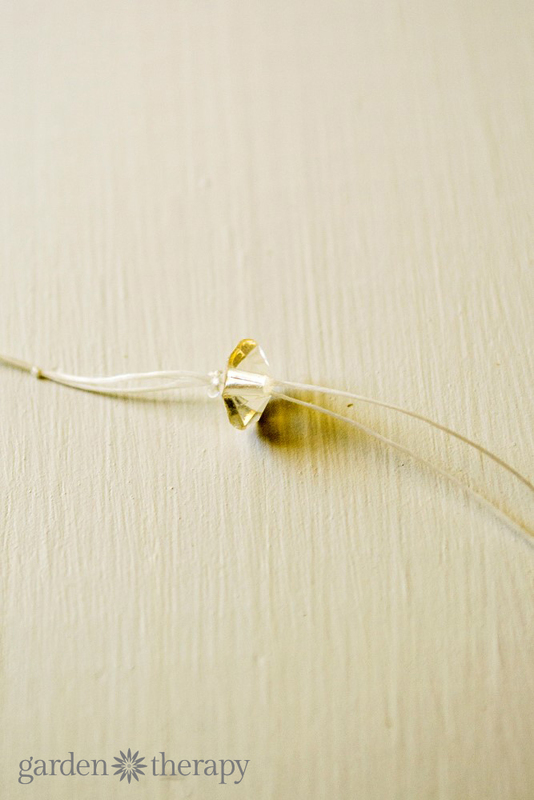 Cut a length of beading string and thread the beading needle and secure the tail with a knot. My beading string was about 36 inches long. Once it was threaded and knotted it was about 13 inches long. String up a bead on the threaded needle. Pull the thread through and then bring the beading needle back under the bottom of the base (where the knot is) and back through the bead. This will serve as a stopper for larger beads. 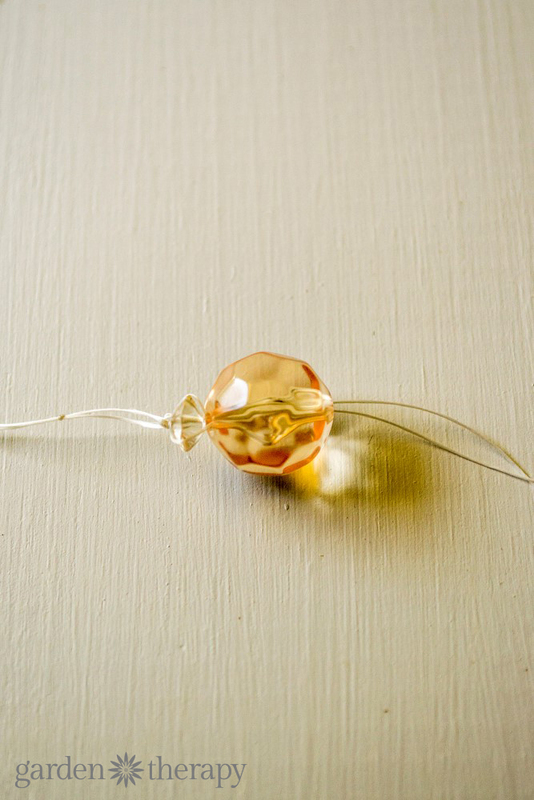 String up a larger bead and place it next to the smaller stopper bead. When you are done adding beads, always end with a smaller bead (the stopper bead) by passing the threaded beading needle back through the base of the smaller bead as explained earlier. Continue to string beads. I spaced my few inches apart for an open look. You can also stack the beads one after another. Each one of my beaded strings were about 13 inches long. You can make them longer or shorter if you like. 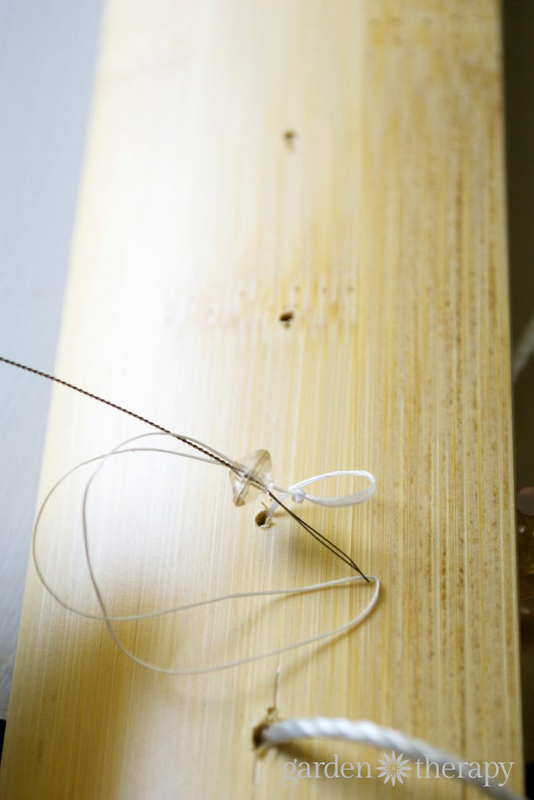 Pass the bead needle (that’s still attached to your completed string of beads) through one of the holes in the piece of wood. Take a small bead and pass the beading needle trough. Bring the beading needle back around and pass it through the bead again. Secure it with a knot and cut the string. 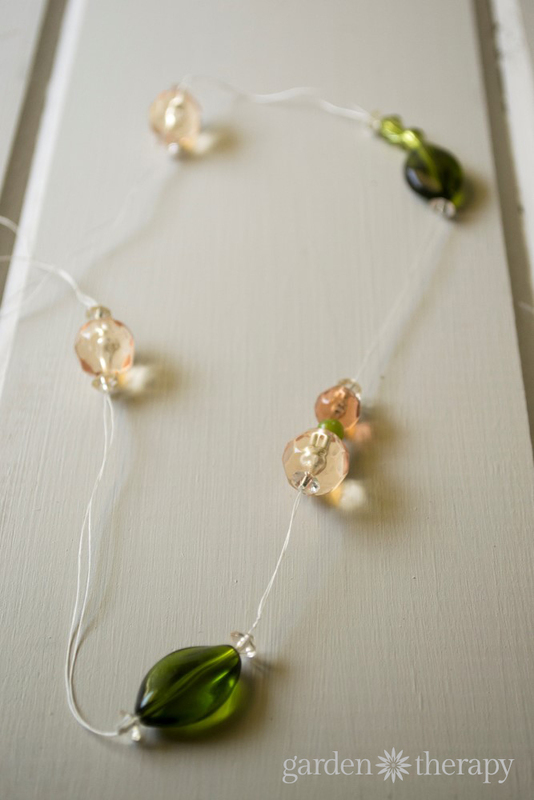 Continue making strings of beads and securing them to the piece of wood one string at a time. 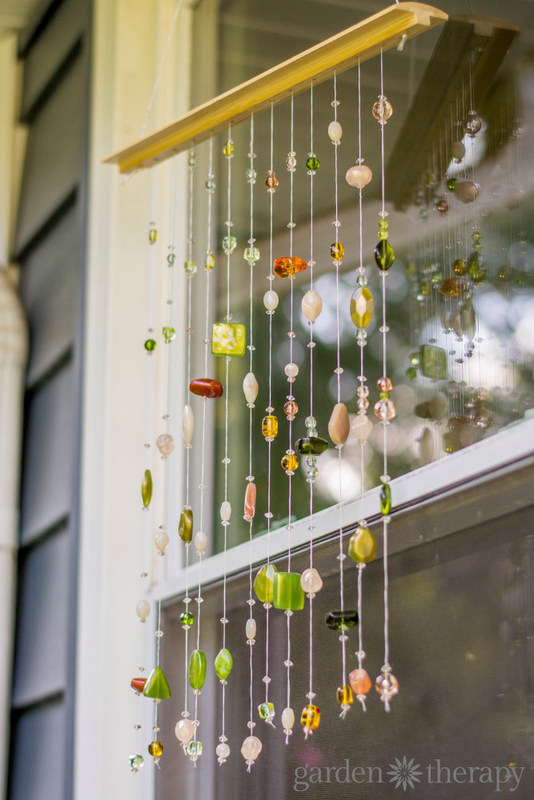 Now, hang your beaded suncatcher mobile in a window that gets plenty of sunlight and watch it sparkle! My mobile hangs in the window that the birds were flying into and I am glad to report that the suncatcher is doing its job of breaking up the reflection. It’s pretty and keeping my feathered friends safe. 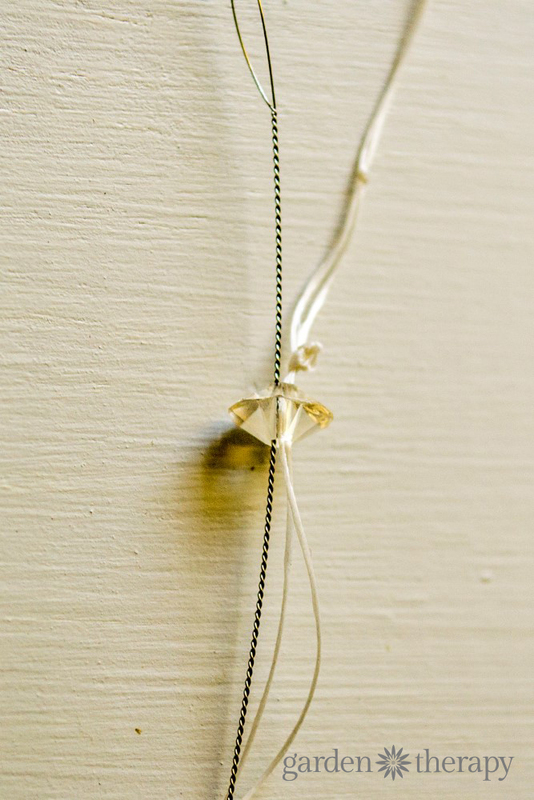 « Make This Sweet Acorn Nest Necklace For a Fun Fall Craft! Oh my…I’m so confused. 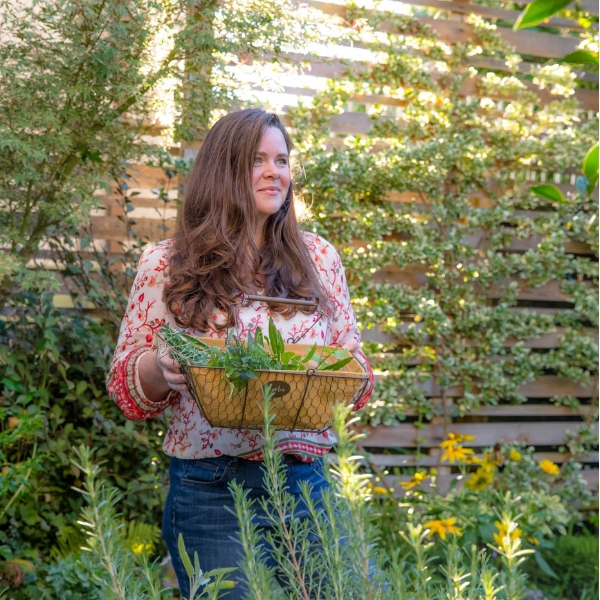 I came here to your site because it said “Garden Therapy” And because the blurb about it said tutorial and tying (the thing I have the hardest time with) — I am feeling untherapied right now…can you clarify the first part, please? Thank you. Thank you. I would love to put this on our blog: blog.GoodyBeads.com It’s perfect for Spring Cleaning your stash of beads.